Chinese style salads are becoming increasingly popular as people become more adventurous and look for alternative recipes to make salads more exciting and tasty. First place the egg noodles in a pan of boiling water and once cooked remove and drain, ensuring that all excess water has been removed. Next take the sunflower oil and heat in either a large frying pan or, preferably, a wok. As the sunflower oil begins to heat up add the ginger, carrots, chilli, lemongrass, sugarsnap peas, garlic, sweetcorn and peppers. These should take approximately 7 minutes to cook. The next stage is to add the spring onions, soy sauce, Chinese leaves, egg noodles and sesame oil. Once all these ingredients have been added stir together for approximately 2 minutes using a medium heat. At the end of 2 minutes the contents of the frying pan or wok should be well mixed and hot. Next mix in the peanuts and coriander and the salad is ready to serve. 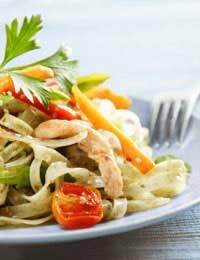 The Chinese noodle salad is very versatile and it is possible to adapt it to suit most tastes. An example of this is Chinese noodles with peanut sauce. This again is easy and quick to make and, like the recipe above, is very tasty. First boil noodles at medium heat until they are tender, but firm. Next remove all excess water and place under a cold water tap until all heat has gone. After draining add and mix with sesame oil. For the dressing blend all the remaining ingredients together, until they become paste, before adding to the noodles. If the paste is too thick for your liking you may add hot water to thin it out.